I am a student and I don't have an e-mail account at Marquette. How do I get one? I am a new employee. How do I get my e-mail account? What Web browser can I use with eMarq? How much space do I get on eMarq? How do I send an e-mail to multiple recipients? What is the maximum number of email recipients I can enter in the “To:” field of an email from my eMarq account? How do I change my eMarq password? Can I forward my eMarq e-mail to another e-mail account? I've forgotten my e-mail account username and password. How do I find out what they are? How can I set up an automatic reply for my e-mail account? Who do I contact for help with eMarq? Why is eMarq/Outlook on the Web grouping my messages? How do I change the default from Reply all to Reply in Outlook on the Web/eMarq? How do I turn off Conversation view in an eMarq/Outlook on the Web folder? How do I view messages in Conversation view in eMarq/Outlook on the Web? When I use eMarq/Outlook on the Web, how do I search for mail and Contacts? What are Apps for Outlook and eMarq/Outlook on the Web and how do I manage them? How do I disable an app in Outlook, so it won't show up in my messages? What is the Bing Maps app? What is the Suggested Meetings app? What is the Action Items app? What is the Unsubscribe app? New students or transfer students receive a letter in the U.S. mail with details about eMarq e-mail address, username and password. This is an automatic process. Once you are entered into the HR system the process automatically generates an e-mail account. Click here for more information. Stable e-mail addresses ensure that messages from faculty as well as important university announcements reach students. eMarq will serve as an official means of communication for the university community. See which browsers are supported by Microsoft. Students, Faculty and Staff are allocated 100 gigabytes (GB) of storage on eMarq. Attachment size is 150MB for Windows, 35MB for Macs. Your e-mail address is what people use to send e-mail messages to you. Use it with your password (which should be kept secret) to login to eMarq/Outlook on the Web and access your e-mail messages and calendar entries. This provides an additional level of security so that someone else cannot access your eMarq account. Your username (example: 23d4smithj) is a unique identifier that will enable you to login to some Marquette applications (e.g. CheckMarq, D2L and MyJob). When sending messages to multiple recipients, you must use a semicolon (not a comma) to separate the recipients. The number of entries in the “To:” field is limited to 100. This limit does not affect the use of a distribution list, messages sent with a mail merge (by its nature it places a single address in the "To" line), and exempted accounts. Student e-mail addresses are based on the legal first, middle, and last name on record in Checkmarq. Faculty and staff e-mail addresses are based on the legal first, middle, and last name on record in MyJob. Marquette offers the ability to generate an additional email address using a 'preferred' first or last name if it differs from your legal name. See Changing your display name and email address. The only way the legal name email address is changed is if a legal name change occurs either when changes are submitted by the employee via MyJob or, for students, proper documentation is presented to Marquette Central, as appropriate. When you change your legal name, your legal name email address is automatically updated to reflect new name and you will retain your previous (1) legal name email address as an email alias. If you know your current password, change your password in eMarq/Outlook on the Web. If you forgot it and have already set up for recovery, you can reset your password. Yes! Learn how to set a forward or remove a forward. If you forgot your username and password, call the IT Services Help Desk at (414) 288-7799. 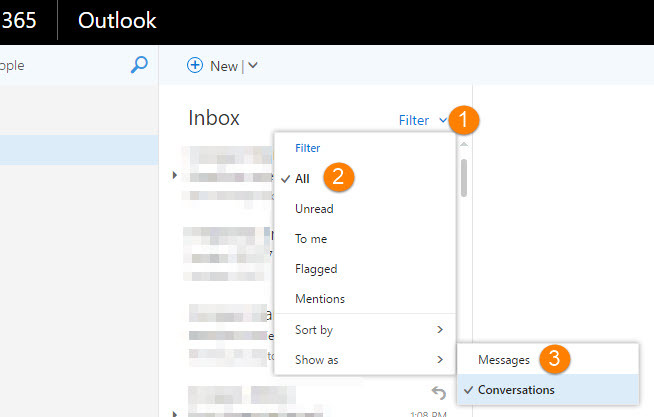 Set up automatic replies in Outlook or Outlook on the Web. 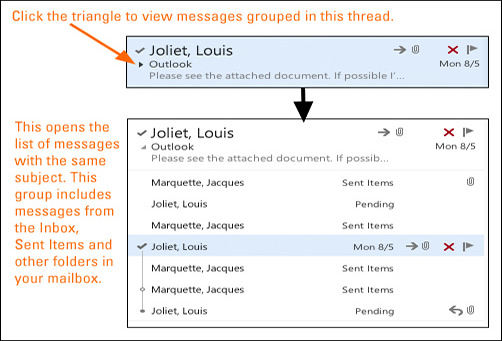 Outlook on the Web provides the same conversation view and experience as Outlook : by default, messages are displayed in threads so that all the messages on a particular topic are grouped. No more searching for a previous message to check what the response is referring to. When a new message in a thread comes in, the whole thread gets moved chronologically to the date/time of the new message. Conversation view has its benefits and drawbacks, but if you don’t like it, you can turn it off. There is no global setting for all folders, set the view for each folder. Enter reply in the search box. Click or tap Reply options. When Reply settings open, select to make the default response Reply Click or tap Save. Click the "Filter" down arrow and scroll down and click Show as > Messages to turn off Conversation View. Enter your search top left. What are Apps for Outlook and Outlook on the Web and how do I manage them? 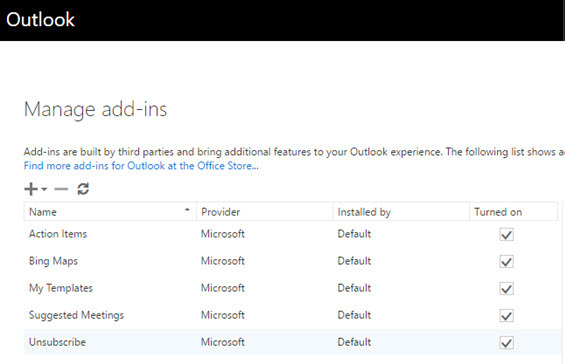 Four Outlook apps are installed by default and enabled in Outlook on the Web. 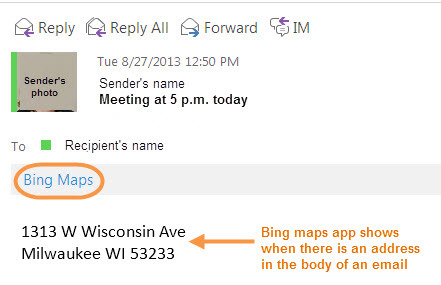 Bing Maps, Suggested Meetings, Unsubscribe, and Action Items add tools that you can use. Learn more about managing apps in eMarq/Outlook on the Web. Click File > Manage Manage Add-ins. This will take you to eMarq/Outlook on the Web. Check the app name to turn it on, or uncheck it to remove it. When you open an email that has a street address in it in Outlook or eMarq/Outlook on the Web, there will be a link at the top of the window. When you click on it, it will map the address in the body of the email. A Suggested Meetings link will appear at the top of a message if the message includes a date and time. Clicking the link shows you a suggested meeting or prompts you to create a meeting at the date and time. An Action Items link will appear at the top of a message if the email includes requests for action (e.g., "Please review the attached.") Clicking the link shows you suggested tasks that you can add to your Tasks in Outlook or eMarq/Outlook on the Web. An Unsubscribe link will appear at the top of a message if the email includes links for unsubscribing from receiving further emails. Clicking the link gives you the option to unsubscribe (if feasible) or to block the sender. If you have any questions, please call the IT Services Help Desk at (414) 288-7799, or e-mail helpdesk@marquette.edu.